The RV (Recreational Vehicle) rental business is alive and strong. With over 7.2 million RV’s on the roads today and more than $350 million spent on Recreational Vehicle rentals, the RV has certainly become a viable and popular option for Americans and foreign visitors to visit the amazing outdoor places of the United States. While one in twelve households own an RV, for millions more of us renting one is a far more practical way to go. 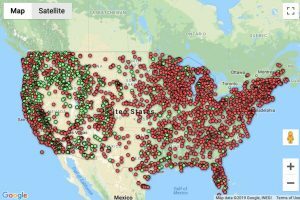 Fortunately the RV industry has been paying attention and as a result there are over 460 RV rental locations all around the United States making it easier than ever before to locate, rent, and enjoy this means of enjoying the great outdoors. What are the advantages of renting an RV? Affordability: Many of us under the false impression that renting an RV is way too expensive. In fact, the opposite is true. A recent independent study showed that RV rental vacations are actually 24-73% less expensive than just about any other form of recreational travel beating out everything from air travel and cruise lines to automobile and hotel type vacations. Even with higher gas prices the cost of a 7-day RV vacation is substantially easier on the wallet when compared to all of the associated costs of other vacation types. Travel is simpler: Nothing ruins a vacation faster than a canceled or delayed flight. Or maybe you have noticed how much of a hassle it is to have to repack your suitcase every time you change from one hotel to the next. Or maybe you are just tired of the stress that comes with trying to figure out which restaurant you are going to choose for your next meal. Not to mention just how fussy kids can get when you constantly have to change their environment every day. RV’s solve all of this. All of your cloths, toys, and travel items are in one place and the place goes everywhere with you. You stock the fridge and pantry and make most of your meals right there on the spot without having to locate a dining experience that will meet all of the families needs. You never have to worry about hotel reservations and can change your travel plans without worrying about where you stay. No one will want to rummage through your bags or wave a metal wand over your person. All in all renting an RV, loading up the gear and kids and hitting the road is simply a more stress free experience. No Special training required: There was a time when driving a recreational vehicle was akin to piloting a 16-wheeler and just about as dangerous. Not so any more. With all RVs (especially rental RVs) coming equipped with power steering, power brakes, cruise control, and adjustable driver’s seats, driving an RV is no different than driving your car. Sure, they are bigger, but that is really the only difference and with so many campgrounds, parks, and recreation areas now catering to the needs of the RV, getting around is becoming easier all the time. You don’t even need to have a special driver’s license. Your State issued drivers license may be all you need. We recommend checking with your local DMV or law enforcement agency to check any regulations specific to your state or any state that you will be traveling to. Enjoying the whole experience: RVers are famous for saying; “half of the fun is getting there”. Much of what we miss out on when traveling by air or rail is actually seeing the country that we pass through on our way to the destinations. This is what has made auto travel in the United States so strong over the decades. Renting an RV will give your vacation the added benefit of seeing and experiencing more as you travel from one destination to the next, unlike other forms of travel that really are nothing more than dull spots in an otherwise exciting vacation. Take more with you: Vacationing in an RV gives you the ability to take more with you than you could normally pack into your luggage. Have you ever been on vacation in the outdoors and found that you wished you had been able to bring your fishing pole, bicycle, more toys for the kids, your photo/video equipment, or kayak? We all have. An RV lets you do this more readily. They can handle the load and offer more storage and rack space than any other form of personal travel. There is a size for every need: No matter what your situation, a single person or family of 5. There is an RV that will meet your needs. There is no doubt that renting an RV for your next travel adventure is not only an affordable and convenient option, but one that is readily available and offers the ability to have a truly carefree, relaxed experience.